Hello, I'm Ralph Knoerr and this is my sailboat, Nightwatch. A Durbeck 46. 46.75 on deck, 13.66 beam, 5.17 draft 1307 sq ft sail area. Great cabin with center double berth. Force 10 stove, just like real sailors. 9 years of upgrades and one of these years we will retire and you can find this kid living on island time. I started sailing at 6 years old using my fathers tin fishing boat, an oar as a mast, another as a yardarm and an old throw rug as a sail. My mother lost her clothes line to the project. Aye she was the scourge of the neighborhood. All the neighbors wanted him to clean that mess out of his boat. That was the first of six boats. The next was a rotten Y-Flyer. Got that one at 12 years old. That got me to my collage days and then to the Navy. That was good for a mid-west lake sailor. Let see that went: college, marriage, Navy, start career, 2 kids and a C-Lark 14. That one got me my first real silver, actually pewter. Again lake sailing, but we were slowly moving south. Number 4 was a Newport 23. Pop-top, port-a-potty, alcohol stove. Had everything but a dishwasher. Yea we raced it also. Got more silver. May have been the only person in the world racing that model boat. Win a race or a series and effect the Ports-Smith rating for the entire fleet. One must always get a bigger boat. Finally to the Gulf of Mexico and a Hunter 27 named Harmony. Pressurized alcohol stove and pressurized water and a marine headâ¦, diesel engine. Almost yachty. 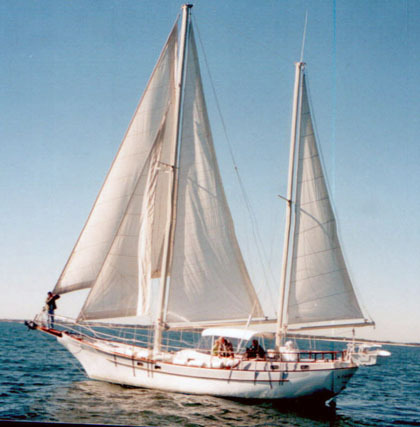 Life goes on, kids graduate from collage, get married and have successful careercareers in Real Estate and Medical Equipment sales, and best of all, a super wife who has been my sailing partner for 40 years.